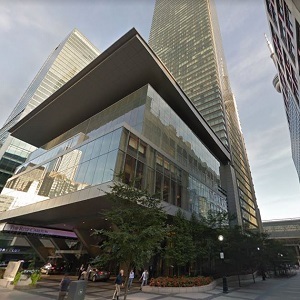 Cadillac Fairview has acquired full ownership of The Ritz-Carlton, Toronto hotel from Simcoe Wellington Hotel Ltd. Partnership, its former partner in the flagship downtown property. Cadillac Fairview told RENX it purchased the remaining 60 per cent which it did not already own, via this transaction. Though it did not release any other financial details, the company said Marriott International will continue to operate the hotel under The Ritz-Carlton brand. “As one of the original developers of The Ritz-Carlton, Toronto, we are proud to increase our ownership interest in one of Toronto’s premier luxury hotels,” said John Sullivan, president and CEO of Cadillac Fairview, in a prepared statement Monday morning. The 53-storey building comprises 20 floors featuring 263 luxury rooms, with the upper 33 floors dedicated to private Ritz-Carlton Residences and dining establishments TOCA, DEQ Terrace and Lounge and the Ritz Bar. The hotel opened in 2011, after being developed by Cadillac Fairview, Graywood Developments and The Ritz-Carleton Hotel Company at a cost of about US$300 million. The building contains about 700,000 square feet of space, including both the hotel, condos and other facilities. The Ritz-Carlton, Toronto is recognized as one of the top luxury hotels in Canada, as demonstrated by its Forbes Five Star Award & CAA/AAA Five Diamond Award. The hotel is a preferred location in the luxury group market for high-profile meetings, with 13,000 square feet of meeting space, and is a popular luxury hotel hub for the entertainment business for the Toronto International Film Festival activities. In addition to its meeting facilities and restaurants, the hotel is known for Spa My Blend by Clarins, which has been awarded Travel+Leisure #1 Hotel Spa in the world, Forbes Four Star Award, and CAA/AAA Four Diamond Award. It also offers an exclusive luxury club floor, with complimentary culinary selections and a dedicated concierge. Although the hotel sector is a very small portion of CF’s overall portfolio, Ramparas said the firm owns interests in four hotels in its mixed-use properties across Canada. At the same time as Cadillac Fairview was involved in building The Ritz-Carleton, it was also developing the RBC Centre — a LEED New Construction Gold-certified office tower right next door. The 48-storey complex and podium contains 1.2 million square feet of space and CF, at the time, noted it would provide ready-made potential business clients for the Ritz-Carleton. Cadillac Fairview is one of the largest owners, operators and developers of office, retail and mixed-use properties in North America. The Cadillac Fairview portfolio is owned by the Ontario Teachers’ Pension Plan, a diversified global investor which administers the pensions of more than 323,000 active and retired school teachers. The real estate portfolio also includes investments in retail, mixed-use and industrial real estate in Brazil, Colombia and Mexico. Valued at around $29 billion, the Canadian portfolio includes over 37 million square feet of leasable space at 67 properties in Canada, including landmark developments such as Toronto-Dominion Centre, CF Toronto Eaton Centre, CF Pacific Centre, CF Chinook Centre, Tour Deloitte and CF Carrefour Laval.